Free This Weekend? Visit Athlone! Often, we find ourselves with spare time at weekends & wishing we hopped on a bus and done something productive with our Saturday. Well here’s a suggestion from the fine folk in Citylink Office in coming up with lots of different ways to pass the time in Athlone. Lough Ree Yacht Club in Athlone, County Westmeath is the second oldest sailing club in the world. Founded in 1770, Lough Ree Yacht Club tradition of organised pleasure boating in Athlone goes back to at least 1731. 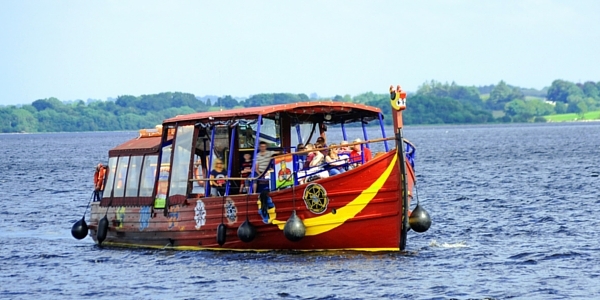 A regatta on the Shannon was amongst the ‘diversions’ promised for a festival week in the town. The club has very active fleets of Shannon One Designs, Cruisers, Mirrors, Picos and Optimists with racing going on most weekends in one or more classes. Athlone Castle in Westmeath is a 12th-century castle and family-friendly attraction in the heart of Ireland. See Athlone’s history, people, castle and battles explored and brought to life at Athlone Castle Visitor Centre with modern exhibitions. Athlone Castle and Visitor Centre is a treat for all the family, with courtyard picnic facilities and picturesque town views. This 12th-century stone castle was built for King John by Bishop John de Gray of Norwich, designed to defend the crossing point of the river at Athlone. When you walk into Sean’s Bar in Athlone, the oldest pub in Ireland, you join the uncountable number of visitors who have been stopping here for a drink, a chat and maybe a bit of music for more than a thousand years and we have the distinctions to support it. No wonder, Sean’s Bar is located in the very heart of Ireland, on the banks of the beautiful River Shannon at its intersection with the Esker Riada – the ancient route carved by glaciers that allowed travellers safe passage across the bog for thousands of years. You can find us just next to Athlone Castle, a 12th century Norman Castle whose residents may have frequented the pub! There are a variety of helmets, swords, shields and a scroll for each child. Fun and excitement for all the family. Glendeer Pet Farm, in County Westmeath, is an interactive experience where people can see, feed and pet animals. Animals include deer, pot belly pigs, llamas, emu, ostrich, goats, donkeys, sheep, monkeys, wallabies and tortoises. Glendeer Pet Farm, 8km west of Athlone in County Westmeath, is an interactive experience where people can feed, pet and hold some of the animals, which include deer, pot belly pigs, llamas, emu, ostrich, goats, donkeys, sheep and lots more including the new arrivals monkeys, wallabies and tortoises. So we have compiled a list of some of the best things to do in Athlone, there are tonnes more fun stuff to do in the heart of Ireland but we’ll let you find out. In addition, we have attached our Galway-Dublin Commuter service timetable which stops off at Athlone B&Q & Athlone IT. Also along our Galway-Dublin commuter route is the Kilbeggan stop, why not have a look at our blog article dedicated to all things Kilbeggan, it makes for a good read.